In the March quarter 1911 Matthew's mother died, and by the time of that year's Census (RG 14/21284) Matthew was working as a "Farmer" and living at the same address in Flagg with his widowed father and two sisters, Sarah and Maria. By the time of his enlistment Matthew had moved to live at Burbage, Buxton. Matthew's Service Records do not appear to have survived. However, his Medal Index Card shows that he entered France to join his Battalion after the end of 1915 as he did not qualify for the 1915 Star Medal. It seems he was rejected by the Army three times before enlisting at Derby near the end of January 1917. The 13th (Service) Battalion of The Middlesex Regiment was formed at Mill Hill in September 1914 as part of K3 (Kitchener's Third New Army) and attached to 73rd Brigade, 24th Division. In May 1915 they moved to Shoreham and to Pirbright in June. Orders were received on the 19th to move to France and the first units departed one week later. During 1916 the Division were engaged The Battle of Delville Wood, 15th July - 3rd September, and The Battle of Guillemont, 3rd - 6th September, both phases of the Battles of the Somme 1916. The first major action of 1917 would be The Battle of Arras (9th April - 16th May). Towards the end of the year Matthew's Divisions took part in The Cambrai operations, 20th November - 30th December 1917. The following year during The First Battles of the Somme, 21st March - 5th April 1918, the Division was engaged in the actions at The Battle of St Quentin, 21st - 23rd March; The Battle of Rosières, 26th - 27th March, and The Battle of the Avre, 4th April 1918. 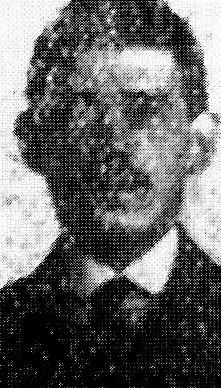 'The High Peak News', reporting Matthew's death, stated that he was home on leave in March 1918. During the Final Advance in Picardy he fought in The Battle of Cambrai, 8th - 9th October 1918, a phase of the Battles of the Hindenburg Line. The Battalion War Diary shows that on the 9th October 1918 the 73rd Brigade took up a position in a line in advance of the town of Awoignt and advanced until into touch with the enemy about 12.00 p.m. on the line Cagnoncles-Cauroir. Matthew's 13th Battalion was in support during this operation to the other two Battalions of the Brigade. The night of the 9/10 October was spent on the railway cutting in front of Awoignt. "The enemy having retired as far as RIEUX, the 9th Royal Sussex followed. The 13th Middx passed through and pushed on. Cyclists and Cavalry reported enemy holding line beyond RIEUX and AVESNES. The Battn was ordered to advance and succeeded in gaining the high ground N. E. of RIEUX, the objective ordered. The order of advance was 'A', 'C', 'D' Coys in the line with 'B' Coy in close support, this Coy was subsequently pushed into line. Heavy shelling and machine gun fire was met with, the total casualties being 6 Officers and 108 men killed, wounded and missing." "The line gained was held during the night and in the morning 'B' Coy in the right centre attempted to extend the line along a sunken road. Considerable opposition was met with. Capt Black being wounded and 2/Lieut EARLEY killed. [This was 38 year old 2/Lt. William EARLEY] During the morning however the line was established. At about 600 hours the 17th Brigade passed through the line to continue the attack and the Battn came under heavy shell fire all night and the following morning. During the morning the Battn was withdrawn to billets at RIEUX, arriving during the afternoon." The remainder of the Battalion then remained in billets at Rieux until the 13th October when it moved to Aveines-les-Aubert arriving in the evening about 5.30 p.m. and remained there until the 16th. CWGC Records show that 19 men, including Matthew, of the 13th Battalion died on the 10th - 11th October 1918. 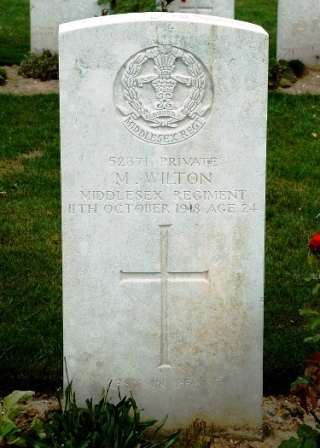 He is one of the 13 who now lie side-by-side in St Aubert British Cemetery.